Eating quinoa five or six times a week is an excellent way for older adults who might be at higher risk of heart disease because of elevated cholesterol or high blood pressure. One good study found postmenopausal women with heart disease were able to cut down the buildup of plaque in their arteries and stop their arteries from narrowing so quickly. Thus, quinoa could free up your arteries and help your heart function. Want to slash the pain of migraines by helping prevent them from striking? 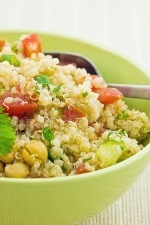 Add quinoa to your diet. Inside the nutritious shell of quinoa is a heaping pile of magnesium, which works inside your body to minimize the risks for a migraine. For example, it relaxes the blood vessels leading to your brain, and stops them from constricting during a migraine attack. Studies have proven that getting more magnesium in one’s diet could reduce the frequency of migraines. One such study had 80 patients take placebo or 600 mg of magnesium a day for three months. With other studies backing up the results, this study found that magnesium significantly reduced the amount of migraines—by 40%. Also, the vitamin B2 in quinoa could help prevent migraines by improving the way energy is used and created within the cells of the brain and muscle. PLUS: Some good news for migraine sufferers. Rkkila AT et al., “Cereal fiber and whole-grain intake are associated with reduced progression of coronary-artery atherosclerosis in postmenopausal women with coronary artery disease.” Am Heart J. July 2005; 150(1): 94-101. Tsai CJ, et al., “Long-term intake of dietary fiber and decreased risk of cholecystectomy in women,” Am J Gastroenterol. July 2004; 99(7): 1,364-70.